George Kalligeros Wins Shell LiveWIRE Smarter Future Award! 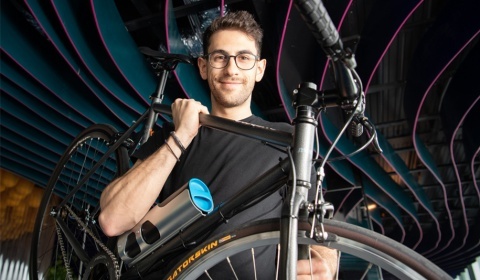 SETsqaured Bath member, George Kalligeros has won the prestigious Shell LiveWIRE Smarter Future Award for his business, Pushme Bikes. Pushme Bikes are disrupting the on-demand delivery industry with quick electric bike conversion and battery swap stations. Self-employed delivery couriers convert their conventional bicycles to electric in under 5 minutes using Pushme Bike’s innovative device. Low battery alerts are sent directly to users’ smartphones, telling the rider to head to the nearest battery swap station (pushpod), located within local convenience stores, to switch their depleted battery for a fully charged one, a process that takes 10 seconds. Pushme Bike’s two products, a plug & play bicycle converter and a network of accessible pushpods, aim to tempt couriers away from petrol scooters and towards cleaner, equally efficient, transport options. • The opportunity to be considered for the annual £25,000 Shell LiveWIRE Young Entrepreneur of the Year Award. The award is open to any entrepreneur aged 16-30 who has been trading for less than a year, or is looking to start trading in the next 12 months, and has an idea that addresses the UK’s future transport, energy, or natural resource challenges, or makes our urban environments cleaner and more sustainable places to work and live in. There is one £5,000 Shell LiveWIRE Smarter Future Award to give away each month to new businesses in the UK (in their first 12 months of trading).